SINGAPORE - Resale prices of non-landed private residential homes slipped last month, after edging up the last four months, according to flash estimates from SRX Property on Wednesday (Aug 10). Prices declined 0.4 per cent in July compared to June, SRX said. It also revised down the month-on-month price increase in June to 0.4 per cent from 0.5 per cent. The price decline in June was across all locations - with the prime districts, city fringe and suburban areas recording dips of 0.5 per cent, 0.6 per cent and 0.3 per cent, respectively. Year-on-year, resale prices last month were marginally up - 0.1 per cent - from July 2015. They are still down by 6.6 per cent from their last peak in January 2014. 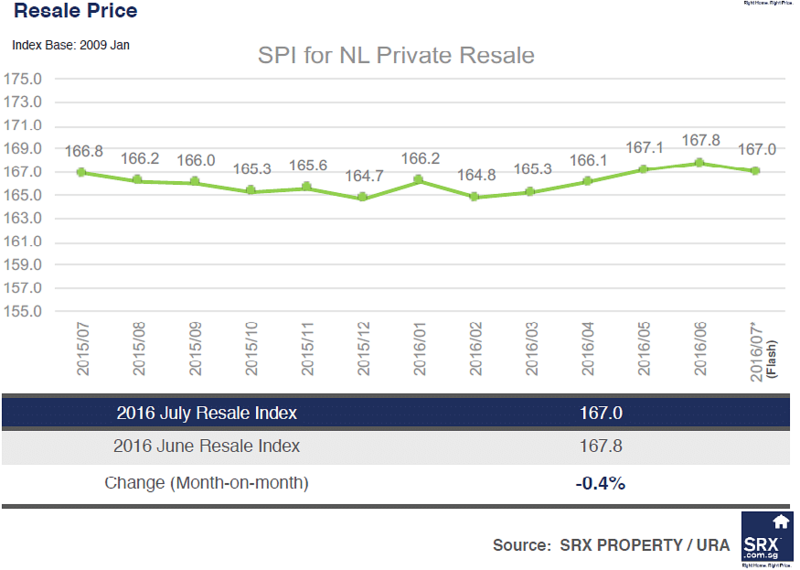 SRX Property's data also show that 10 per cent more resale units were sold in July compared to June - 770 from 700. But overall, sellers were more willing to go below the estimated market value of their property to make the sale. 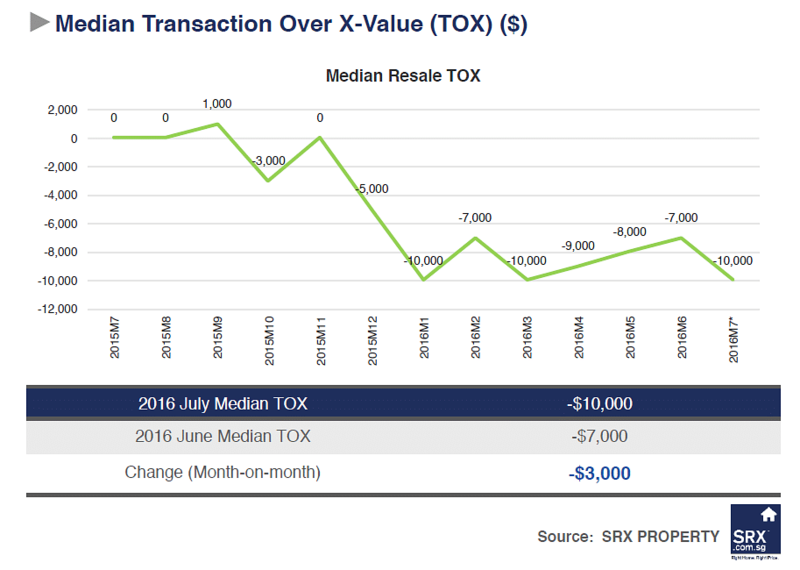 SRX's median TOX - which measures whether buyers are overpaying or underpaying its computer-generated market value - came in at negative S$10,000 in July from negative $7,000 in June. For districts with more than 10 resale transactions in July, district 20 (Bishan, Ang Mo Kio) posted the highest median TOX of +S$10,000. District 3 (Queenstown, Tiong Bahru) posted the most negative median TOX of -S$40,000. Year-on-year, the 770 resale units moved in July 2016 were 31.4 per cent higher compared to the 586 units resold in July 2015. Resale volume was still down by 62.4 per cent compared to its peak of 2,050 units hit in April 2010.